Gigabyte M912M M912M specifications, info. (Model: M912M) Specifications, images and news. A netbook with a difference. Despite the relatively heavy 1.35KG, this is a device you can use in some UMPC-like scenarios. The touchscreen is fun to use. Having tested this device, we found it to be very fast due to the high-speed 160GB SATA drive. Battery life is near 3 hours with Wifi on. Touchpad good quality. 2GB upgrade easy. BT 2.1 was included on our test device. Using the Intel low-cost notebook platform, this will be a very good value challenger to other touchscreen convertibles like the VyeS37 and the Flybook V5. 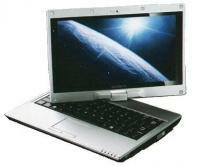 The M version Include the LED-backlit 1024x600 screen which is bright and has good contrast. (The M912X includes a CCFL backlit screen.) Official specs indicate that the M912M has no Bluetooth included but most resellers seem to be including BT now. Check with your reseller if this is important to you. Gigabyte M912M news and review links.